Dental care starts for your baby before the actual teeth appear. The expectant and nursing mother should take care and be informed about what medications they are taking, because certain antibiotics do affect teeth coloration even before they appear! Whenever you are advised to take an antibiotic, do not hesitate to ask your physician about its side effects and whether it will harm the unborn or the nursing baby in any way. We all know that babies learn from imitation and repetition. The best way to teach a child to take care of his/her teeth is to do it yourself. As adults, we should follow a healthy dental hygiene routine ourselves. When children see their parents following a healthy dental care routine, they follow it unconsciously. The cleaning of the teeth starts after a few days of birth. Slowly it should become part of the daily routine. Wipe the mouth and gums of the newborn with a clean gauze or washcloth. This will keep the bacteria away from the mouth. Tooth decay can occur as soon as teeth appear. The sugars in the milk and juices have a tendency to stick to the base of the teeth and invite bacteria to feed on these. Keeping the gums clean is a good way to start dental hygiene for babies. Begin brushing your child’s teeth as soon as they appear. Make it fun thing. Use colorful smalltoothbrush for babies, and nice smelling toothpastes that are especially made for infants and toddlers. The whole event should be done lightly in a pleasant manner. The toothpaste need not be more than the size of a rice grain, a thin film covering the brush. Brush children’s teeth twice a day. Children below 3 to 4 years of age should be supervised to minimize swallowing of toothpaste. Do not allow the toddler to dispense the toothpaste from the tube. Adults should dispense toothpaste. It need not be more than a pea sized drop. Usually after your child is 7 or 8 years, he will have learned to dispense very small drop of toothpaste and brush his teeth in front and back of the gums. Once you are satisfied that your child is able to dispense small amount of toothpaste and is able to brush his teeth on his own, let him follow the routine of brushing teeth twice a day. Remember that praise goes a long way. Praise encourages the child to follow your instructions better. The best way to familiarize children with the atmosphere at the dentist is to take him with you when you visit the dentist for routine checkup. This will prepare him for his own visits. As soon as the first tooth appears, it is time to schedule a visit to the dentist. The first visit may be between 6 months to one year after the baby’s birth. It should not be later than your child’s first birthday. It helps if you talk about the visit before you actually go there, to prepare the child about what to expect. The first visit is mainly to familiarize the infant with the dentist and the surroundings. The first visit may be scheduled in the morning when the child is rested and not hungry,to elicit more cooperation from him. Do not show your anxiety if you have any reservations, or fears about the dental care visits. Keep them to yourself. Refrain from discussing them in front of your child. Children can sense feelings and emotions of adults and make them their own. Do not bribe your child for the visit. Bribing creates the impression of something dreadful or unpleasant. Do not threaten your child with the dental visit. It will create dread and aversion for the visits to the dentist. 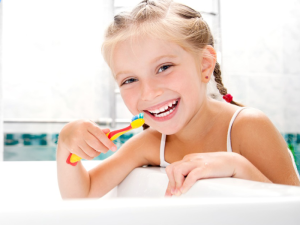 It is important to establish good dental hygiene routine for all in the family including babies and children. Once good habits are formed, it will stop any dental problems get out of hand, saving time, money and pain and distress when children are growing up.